If you need to get some new bowls for your kitchen, this would be a great set to grab! You can get the Anchor Hocking Glass Bowl Set – 10 pcs for only $15.87! This 10-piece mixing bowl set includes the following: 1-ounce, 2-ounce, 4-ounce, 6-ounce, 10-ounce, 16-ounce, 1-quart, 1-1/2-quart, 2-1/2-quart, and 3-1/2-quart. These bowls nest together so that you can save space in your cabinets and they are dishwasher safe! Make sure that you grab this deal soon because the prices can change at anytime on Amazon! 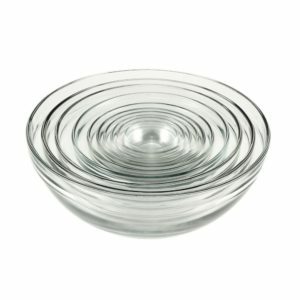 CLICK HERE TO ORDER the Anchor Hocking Glass Bowl Set – 10 pcs for only $15.87 today!